Over the years, down through the generations, with every sunrise and sunset over the city; The history of Kaohsiung is recorded in earth and stone; The memories of the city are locked in the mountains, the sea, the rivers and the harbor; The city's many cultures are remembered through mountain songs and Hakka tunes While the city's management leaves its traces in every move of the city center, the city's dreams take flight to the sky! The city center always serves as the heart of economic and everyday activity in every era. When we follow the footsteps of our ancestors and set out on a journey to rediscover our roots, what we find is not the dust of the campaign trail or gleaming cohorts but surviving ruins and historic buildings that provide a window to the past. From the Old Zuoying Castle and New Fongshan Castle to the Xiwei Administrative Center, each move testified to a different period of prosperity. With the amalgamation of the county and the city for the Centennial of the Republic, the dual administrative centers have defined a new shape for Greater Kaohsiung as well. As you run your hands over the stone wall and read the worn lettering, it seems to take you back to three and a half centuries ago. Koxinga had just driven the Dutch from Taiwan and proclaimed the island the East Capital. Taiwan was divided into one prefecture and two counties, with "Wannian County" encompassing modern-day Greater Kaohsiung, Pingtung County and Greater Tainan. The county seat was located Zuoying and this could be considered the first city center within the borders of Kaohsiung. When Taiwan was reorganized into one prefecture and three counties during the Qing Dynasty. The county seat remained in place. 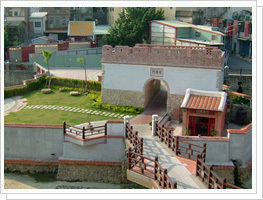 The city also became the first city in Taiwan to be fortified with a stone wall and moat. The surrounding area was filled with farms, temples and markets. The "Zuoying Wannian Festival" that the people of Kaohsiung look forward to so much every year is named after "Wannian County" and is an extension of contemporary traditional festivals. When we return to the "Zuoying Castle" today, it is no longer the political and economic hub it used to be. Modern-day Zuoying is a city of many different faces. It is not only situated at the junction of the High Speed Rail, Taiwan Rail and Kaohsiung MRT, it also retains old settlements, military dependents' villages and new urban developments. Reminders that Zuoying was once a prosperous administrative center can still be seen everywhere today. Walking past Old Zuoying and continuing along the ancient canal of Fongshan seems to bring the golden years of New Fongshan City during the Qianlong Era of the Qing Dynasty back to life. After Old Fongshan Castle (Zuoying) was damaged by civil unrest, Fongshan's county seat was moved from the old castle to Fongshan. The new seat was named "New Fongshan Capital" and became the most important militarily, politically and commercially important city south of Tainan Castle. Six gateways and six batteries were constructed to defend against the frequent unrest. Two walls were also built, with the outer wall being thorny bamboo and the inner wall being earthen ramparts. The walls gave the boundaries of the New Fongshan Castle the shape of an "ankle boot". The construction of the Caogong Canal during the Daoguang Era provided the local area with water for irrigation. Rice could be harvested twice a year so the city was quite self-sufficient and grew into one of the major cities of Taiwan. Today, Fongshan is famous as the gourmet capital of Greater Kaohsiung. 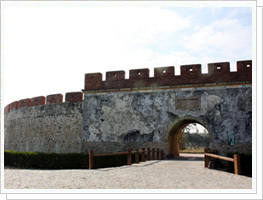 Though only original traces of the original city walls remain, the Dongbian Gate a well as the Pingcheng, Xunfeng and Chenlan batteries have survived to ofer a glimpse of New Fongshan's original size and importance. Though the double walls have long been allowed to fall into ruins, 6000 people were mobilized for the 220th birthday of Fongshan in 2008 to mark out the old boundaries again. The feat not only recreated the glory of Fongshan in a different way but also expressed the importance of this administrative center in the history of Kaohsiung. The sound of long and short blasts from the ship horns, the sight of laden ships passing returning fishing boats under the beam of the lighthouse… For the people of Kaohsiung City, these form part of their indelible memories of Kaohsiung Harbor. Once known as "Takao Harbor", Kaohsiung Harbor was already an important fishing harbor during Dutch period. During the Japanese Colonial Era, the foundations of today's "Port City" were laid as Takao was systematically modernized and connected to the end of the North-South Railway. The city center was relocated several times during the Japanese Colonial Period due to the government's development strategy. Japan initially placed Taiwan under the rule of a governor-general. Administrative control of Kaohsiung City was moved from New Fongshan Castle to the Fongshan Sub-District of Tainan County. When the 8th governor-general abolished the district in favor of states, "Kaohsiung State" appeared for the first time as an administrative region. Development was initially centered around the Cihou region but the government began laying railways, upgrading the harbor, constructing railway stations and passed new urban plans. 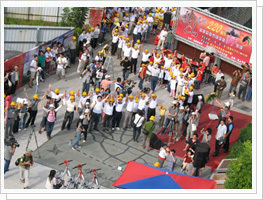 New industries such as refining, machinery, shipbuilding and cement were introduced as well. What is today Hamasen and Yancheng were at the time two reclaimed areas near the harbor that developed rapidly. 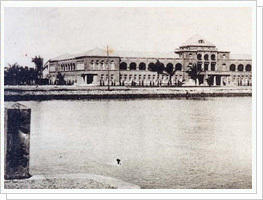 The Kaohsiung State Government was established on Kaohsiung Street (what is today Kaohsiung District Court) and within a span of fifty years, Kaohsiung became the second largest city in Taiwan.